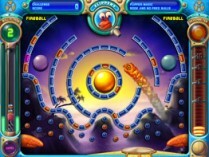 A game called “Peggle Deluxe” used to consume our days. “Peggle Nights” now consumes our nights. The first game is so famous you can find videos of best scores at YouTube. What makes Peggle so addicting is the combination of pinball-style action, lovable characters, great music and nice graphics, not to mention the fact that you can be 3 or 99 and still have fun with it. The psychology of the game is clever. It gets easier just when you can’t face a tougher challenge, and the fireworks and other rewards are neat. It took us a year to go through all the ins and outs of Peggle Deluxe. Peggle Nights is even harder. The program plays Beethoven’s “Ode to Joy” from the Ninth Symphony when you win a level. There are 60 levels in Peggle Nights and a new musical introduction by the Slovak National Orchestra. You can play Peggle Nights for one hour for free before deciding whether you want to buy it for $20, at PopCap.com. Click here to receive the latest column in your email.